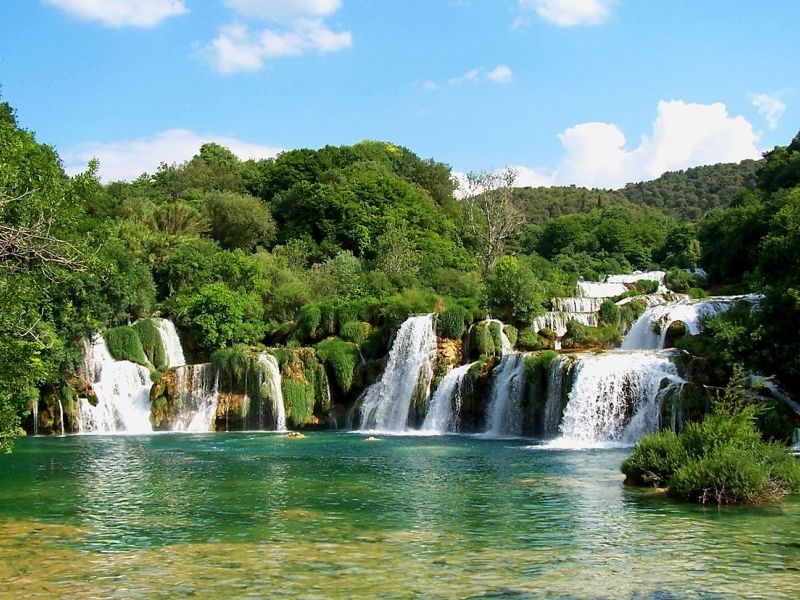 Excursion to Krka national park - Krka waterfalls. Enjoy the natural beauty of the river Krka in Croatia! The route from Split to the destination takes about 1 hour. Most of the time we are driving the Dalmatina highway in an air-conditioned passenger van. We come to NP Krka and our driver is at your disposal for any questions. For a visit to the NP Krka, you have 3-4 hours of free time so you can get there and swim in the places where it is allowed. With a few rapids and its seven beautiful trolling slopes: Bilušić with noise, Brljan, Manojlovac waterfall, Rošnjak, Miljacka waterfall, Roškim slap and Skradinski buko, the Krka River is a natural and karst phenomenon that will take your breath away with your beauty. After a pleasant and refreshing couple hours follow the return to Split. The whole day trip takes 5-6 h.
Krka waterfalls owes its origins to the ravines and streams of the Krka and Čikola rivers. 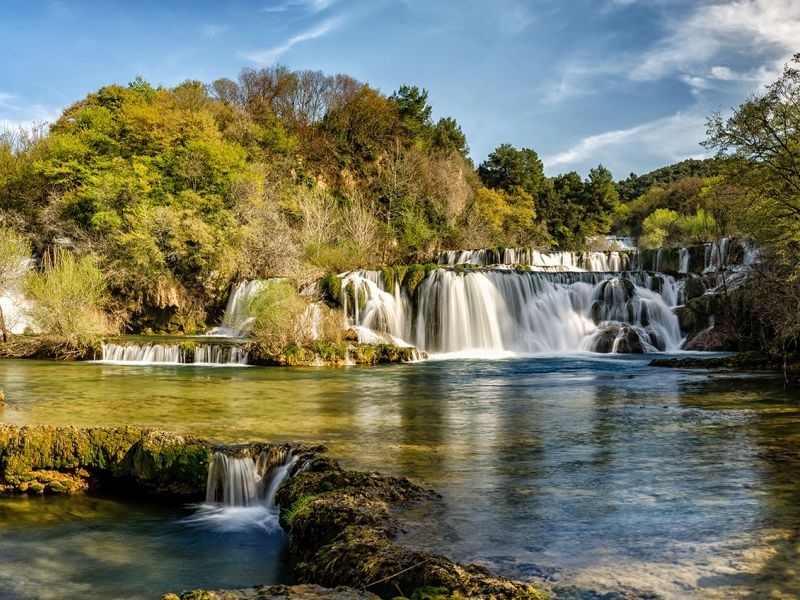 Sedra is a common occurrence, but rarely creates significant deposits that build waterfalls on the Krka River. The sloping waterfalls of the Krka River are very tender and sensitive to natural changes and all human activities. 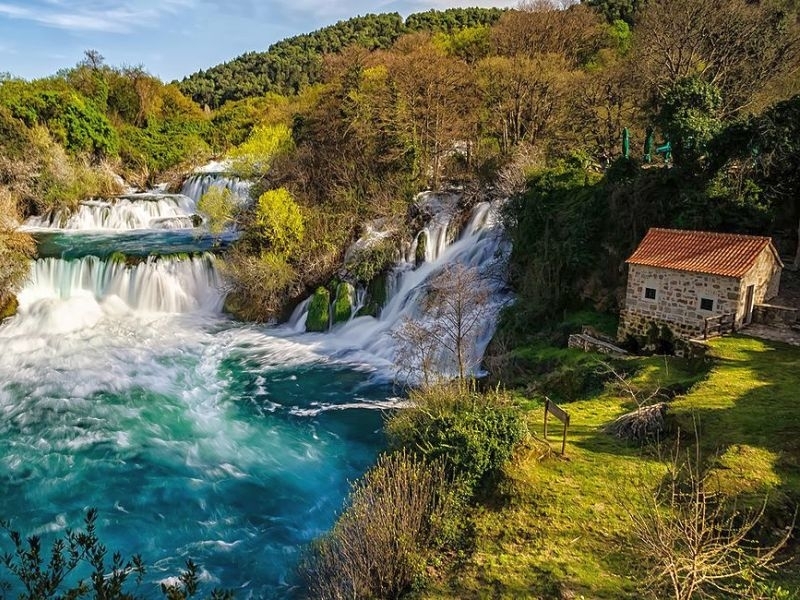 Only with the permanent growth of the phytogenic sedge is it possible to preserve the survival of waterfalls that are the backbone of the hydrogeological and landscape images and the basis of the biological diversity of the Krka National Park. In order to grow, live and grow, it is necessary to preserve the natural equilibrium of the ecosystem of the river Krka and Čikola. With a few rapids and its seven beautiful trolling slopes: Bilušić with noise, Brljan, Manojlovac waterfall, Rošnjak, Miljacka waterfall, Roškim slap and Skradinski buko, the river Krka is a natural and karst phenomenon that will take your breath away with your beauty.